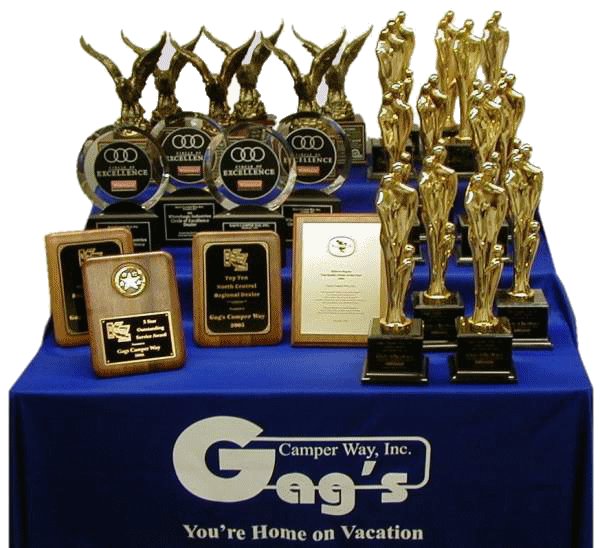 Gag's Camper Way, Inc. was founded by Larry and Irene Gag in 1972. We now celebrate over 40 years of award winning sales and service of RVs and Campers. During those years, we have won many awards including Coachmen's Market Pace Setter Award, Coleman Service awards, Circle of Excellence awards from both Fleetwood and Winnebago. We have won both sales and service awards from K-Z. And Gag's Camper Way was recognized by our peers with the Midwest Region Top Quality Dealer award given by the Recreation Vehicle Dealers Association of America. At the heart of Gag's Camper Way is a commitment to quality. Full time service technicians are on staff working in a shop with 5 service bays. We provide our technicians with ongoing industry and manufacturer training to provide you with the most knowledgeable service technicians who can quickly diagnose and fix your problems. Our sales team has years of RV experience. The sales staff consists of Bill Merritt, Joe Rozga, and Dan Gag. Every year it is our goal to be a little better than we were before. You can count on us to build on this tradition into 2016 and beyond. Stop in, say "Hi," and learn why so many have made Gag's Camper Way, Inc. their source for Recreational Vehicles!